GREATER MANCHESTER PROTEST AXE THE BEDROOM TAX! Supported by : Manchester City Council Unite, Manchester Community and Mental Health Unison, Bolton Trades Council, Manchester & Salford NUJ, Salford Council Unison. EHRC PCS, Manchester Peoples Assembly. Condemned by the UN, scrapped in Scotland, rejected in the Courts, opposed by trades unions and charities, Labour have pledged to Axe the Tax in 2015. In 2014 tenants still face the misery of a policy of malnutrition that brings the stress and the worry of eviction. This cruel tax hits mostly disabled people. Ministers, who live in mansions, have second homes, and feast on subsidised food, introduced the Bedroom Tax. We demand they scrap it now! 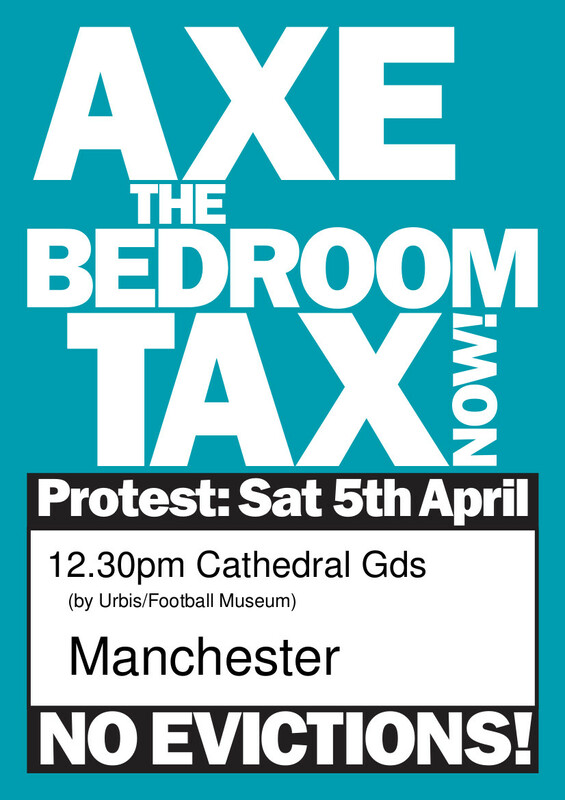 This entry was posted in Activities and tagged GREATER MANCHESTER PROTEST AXE THE BEDROOM TAX! by tamesidegreens. Bookmark the permalink.